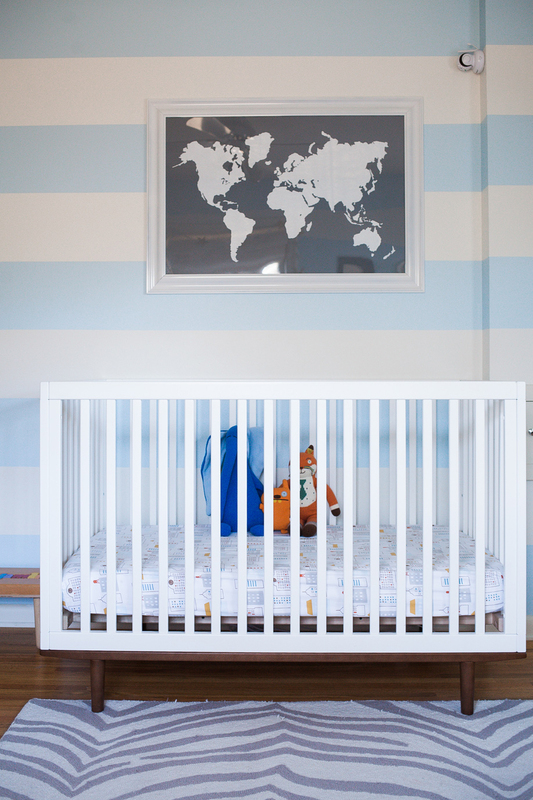 Before Levi was born, I shared my inspiration board for his nursery design but never followed up with photos of his actual room. Although it’s been a while since his bedroom looked like this (we don’t even live in Omaha anymore! ), I’d love to show them to you now. 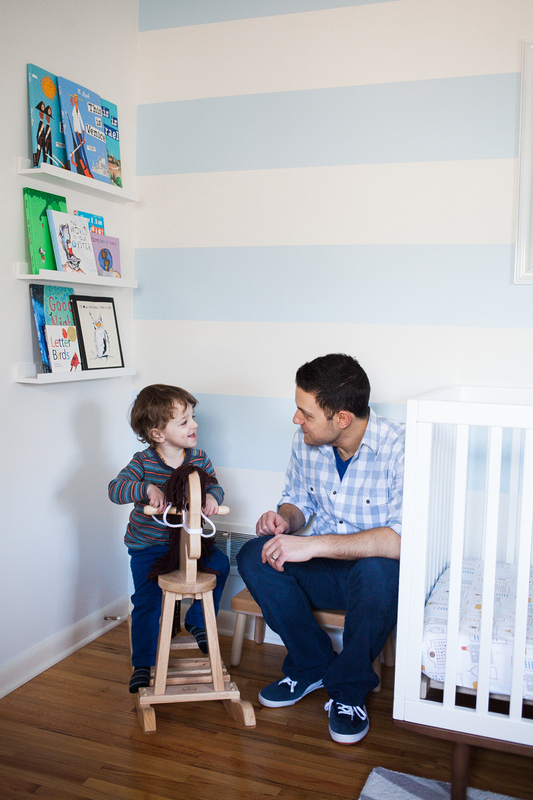 The impetus for this photo shoot — which, funnily enough, took place almost one year ago to the day — was that we were about to turn Levi’s nursery into a big boy room. I wanted to document how the space looked for Levi’s first two and a half years before appropriating the crib, dresser, and chair for Asa’s room. 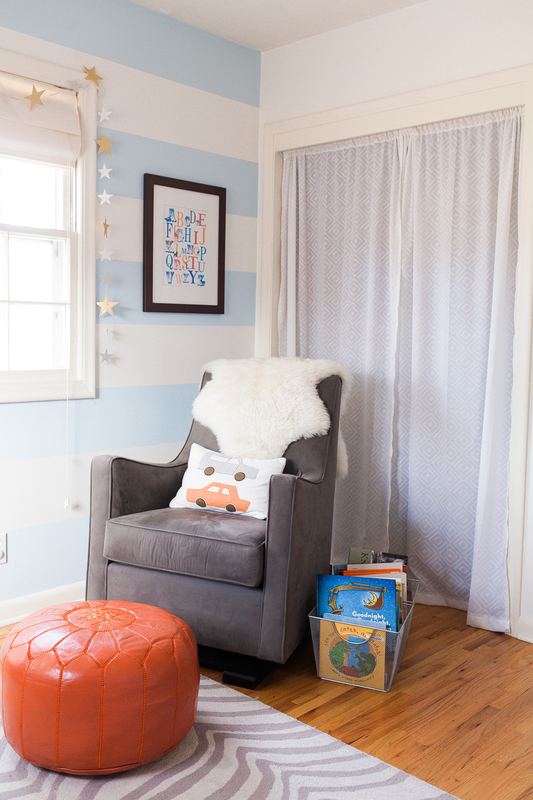 Previously, the nursery had been my home office. I wish I could find photos of the room at that time because it looked so different. The walls were bright green, and a colorful dhurrie rug covered most of the floor. 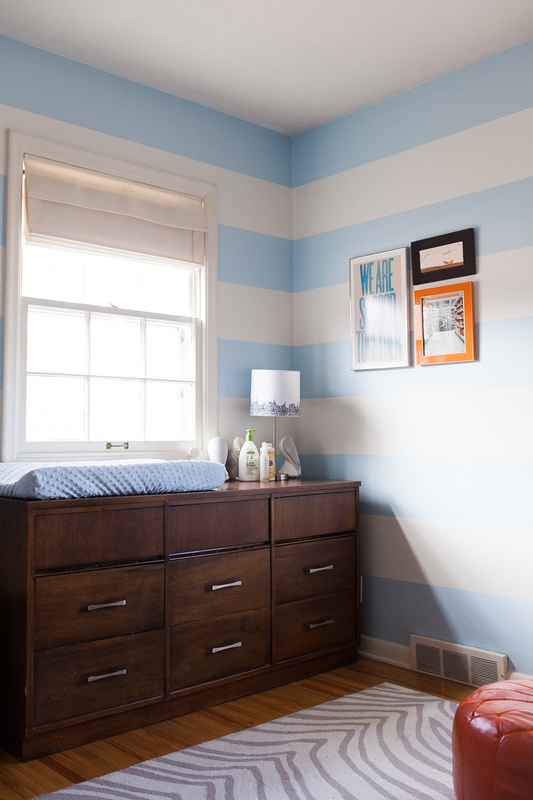 Striped nursery walls were a new trend in 2011 when I was planning Levi’s room. As soon as I decided on a blue, white, orange, and grey color palette, I knew wanted stripes, too. JB was deployed at the time, and the painter I hired was outspoken in his doubt of my vision. Ultimately, however, he acknowledged that the blue and white stripes actually did work in the space. They ended up being my favorite feature of the nursery. The only piece of furniture we had when we started decorating the nursery was the brown dresser. It was a Craigslist find that had previously lived in the bedroom of our first apartment in Omaha and then in the guest room of our house. Because the room was small, I didn’t want to take up space with a separate changing table (plus, it seemed like a waste of money). 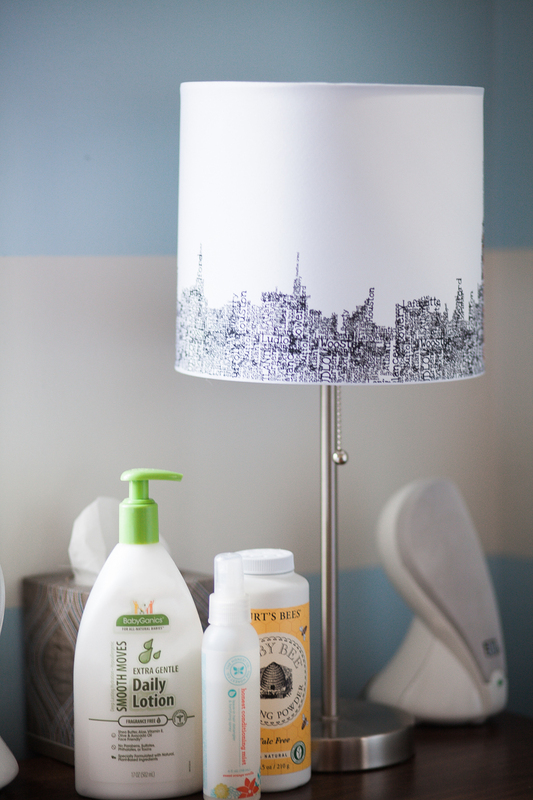 To keep the changing pad from sliding around on the dresser, we positioned it atop some non-slip shelf liner. 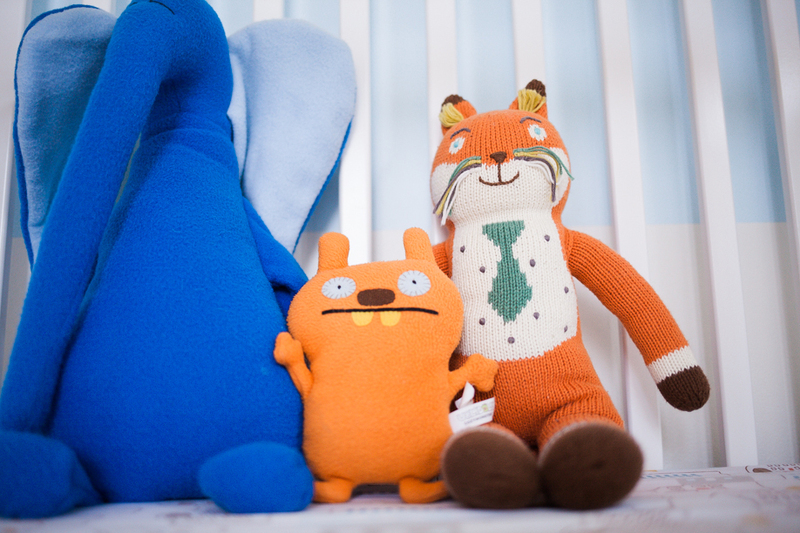 When choosing a chair for the nursery, we opted for a glider because JB was very concerned about little fingers getting smushed by the bottom of a rocker. Although we were happy with the style of this particular glider and with how easy the microfiber was to clean, I think I would’ve preferred the motion of a rocking chair. Also, the seat cushion had the annoying tendency to jut forward when you sat back in the chair. The only reason why I ever wished the nursery was bigger was to fit a proper bookcase. The two wire baskets next to the glider were perfect for holding board books but weren’t quite the right size for the picture books we eventually started reading to Levi. There also wasn’t a lot of storage for Levi’s toys. Whatever didn’t fit on the two shelves adjacent to his crib lived in the closet, hidden behind white window curtain panels a friend graciously hemmed for me. 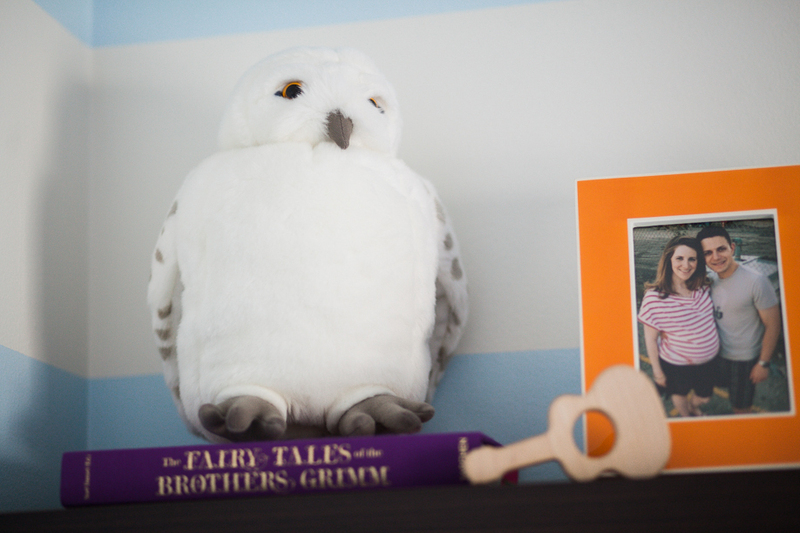 And yes, Harry Potter fans, that is Hedwig the owl. He was a gift from one of Levi’s grandfathers. For a very long time, the wall above the crib was empty because I was concerned about hanging anything too heavy. Eventually, I found a lightweight frame made with plastic moulding and acrylic glazing for the large screen-printed map. It was originally black, so we spray painted it white to keep the look bright. What you can’t tell from this photo, thank goodness, is how badly Levi chewed up the inside of the crib railings. I almost cried the first time I found chipped paint. We tried both store-bought and DIY covers to protect the railings from Levi’s sharp little teeth, but, unfortunately, nothing prevented bite marks. Redecorating Levi’s nursery was emotional for me, but it would’ve been harder had I not been so happy with how his big boy room turned out. Of course, we kept the blue and white stripes. 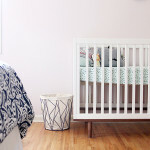 As soon as I finish editing them, I’ll share photos of his updated bedroom, as well as Asa’s nursery (which was also our guest room and my office). 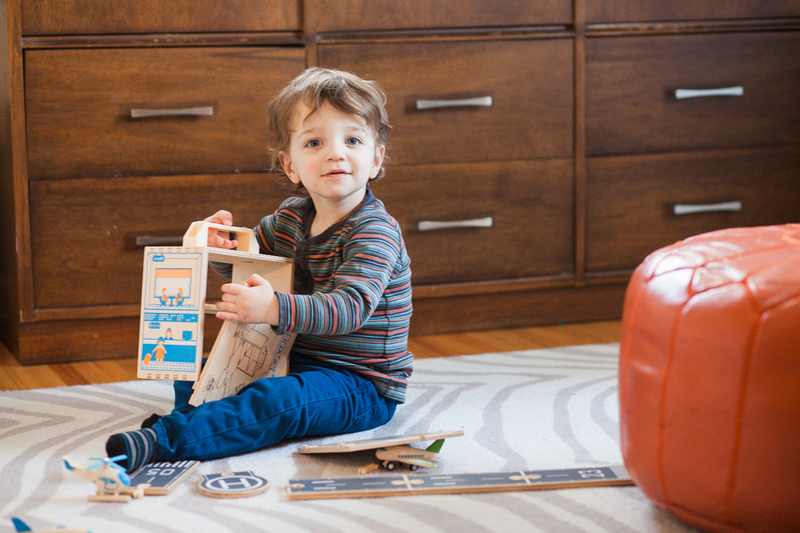 PS – Toddler bed or twin bed: Which would you choose? 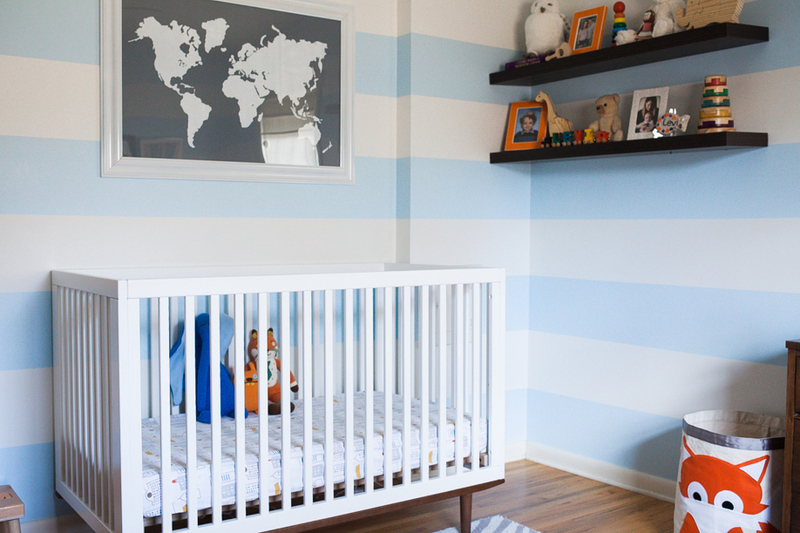 I love the simplicity of your nursery and the striped walls! I’m glad you mentioned the glider. I had my heart set on one but my mother in law surprised me with a rocker. 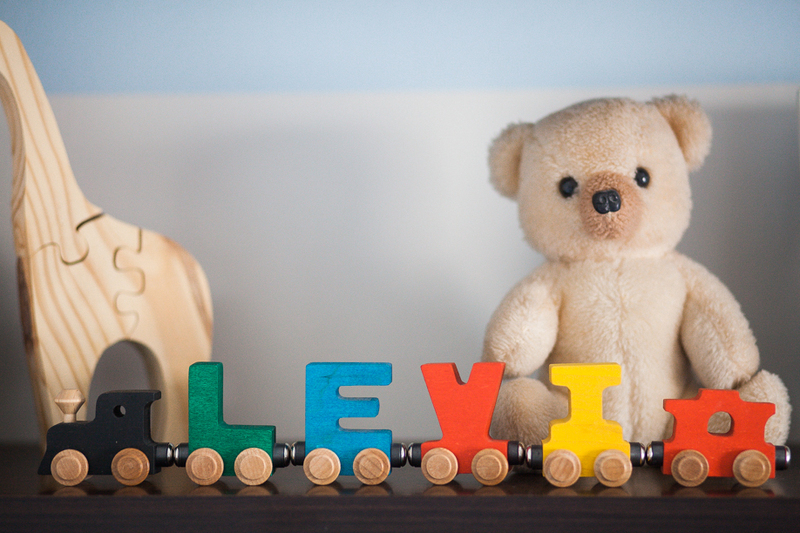 May I ask you where you got Levi’s wooden name train? He’ so adorable! Thank you so much!